Dr. Danylo Kihiczak graduated the medical school from the Rutgers Robert Wood Johnson. He completed both his internship and residency program at the UMDNJ-Robert Wood Johnson Medical School. He is specialized in radiology and board certified in diagnostic radiology. 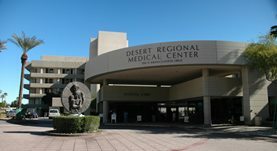 Dr. Kihiczak has been in practice for more than 20 years and is affiliated with the Desert Regional Medical Center. During his career, he has also contributed to 6 publications of medical interest. Dr. Danylo Kihiczak has contributed to 3 publications. Frequency, sensitivity, and specificity of individual signs of diverticulitis on thin-section helical CT with colonic contrast material: experience with 312 cases. Kircher, M. F., Rhea, J. T., Kihiczak, D., Novelline, R. A.; AJR Am J Roentgenol. 2002 Jun. MRI of destructive achilles tendon rupture associated with skin ulceration. Kihiczak, D., Colletti, P. M., Terk, M. R.; J Comput Assist Tomogr. 2000 Nov 01. Use of popular culture as an educational tool in the training of radiology residents. Kihiczak, D., Amorosa, J. K., Siegel, R. L.; Acad Radiol. 1999 Mar.